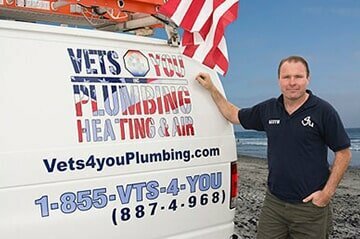 Today we'd like to recognize Vets 4 You Plumbing for providing exceptional service to their clients. Vet's 4 You hires ex-military members and supports non-profit veteran organizations. They stand behind their work with 100% satisfaction guarantee. I had called for a venting problem and was given a 2 hour window for an appointment. Early within that 2 hour window Jim called me and said he was on the way and would be about 15 minutes. **Love that!! ** Jim took care of the problem quickly, answered all of my questions, gave me his card, shook my hand, and was done! Fast, courteous, friendly, efficient, on-time... I cannot say enough about this awesome company! I actually put them in my cell phone because I can't imagine calling anyone else in the future and it'll be handy for referrals (I tend to lose business cards). Thank you, Jim and Vets4You!! During the demolition of the upstairs (remodeling house), we encountered a toilet leak in the master bedroom. Ron and Dean are very polite and explained in detail the work being performed and some minor suggestions to avoid future problems When the work was completed, they cleaned up and made sure everything was working well. An Air Conditioner quit working and I called "Vets 4 You" (based on Yelp reviews) as the company that installed it last year (Stillman Heating and Air) went out of business with no forwarding address!!! Keith from "Vets 4 You" came right out, assessed the situation and gave it a temporary fix and set up an appt to come back and make that a permanent fix. He was very professional, talked to me in terms I could understand, and quoted the repair..........so nominal, I was shocked. Now Amanda has called several times keeping me updated on the situation with Keith and the technician coming with him. Excellent communication and planning. Thank you Vets 4 You. I really appreciate your communication and professionalism. Contact Vet's 4 You for all you're plumbing, cooling, and heating needs- they won't disappoint!